Exactly 49 years ago today, some people thought they heard fireworks. They were wondering why fireworks? They did not know that it was not fireworks that they heard. It was the sound of small arms fire. A group of people decided that they needed to take matters into their own hands. Ask many people who had gone through those era and you will get many tales which you don't or even expect to hear today. I was not born yet. I was a two month old fetus in those days. My father was an Administrative Officer Cadet at the Belait District Office. My mother told me that she and my father had to sleep on the floor in case any stray bullet went through their wooden government quarters in Kuala Belait. One uncle told me that he was almost shot at by another uncle when he as members of the armed guards of BSP went to the Panaga Police Station to take refuge. The police shot at them because they thought the guards wanted to attack the police station. A group of people burst through my father in law's shop in Muara demanding bullets. In those days bullets are sold through licensed shops. One of my former officers told me how his father who was a warden at the SOAS College hostel walked from Kiulap to ensure that the boys were fed. He did not come back until later at night and his family thought he had died. The one and only memorial dedicated to the events of 8th December is currently inside the ferry passenger terminal building in Bangar. The memorial is dedicated to a number of Bruneians who were killed during the turbulent period. What I know about what happened 49 years ago was what I heard and read. A number of books had been written about it. Today my entry is about those books which you can go to the bookshops and buy them for yourselves. "Remember, Remember, The 8th of December." Our own HRH Prince Mohamed Bolkiah wrote this book. Published by Brunei Press in 2007, this one is easily available at any bookshops in Brunei. This one is an easy read and contained lots of photographs making it probably more dramatic and makes the pain of the fight of Bruneian versus Bruneian more intense. HRH Prince Mohamed Bolkiah wrote that "... if we are going to enter this new era confidently, then each of us has to remember our past, acknowledge it and respect it. That's what the founders of ASEAN did and that's what we all must continue to do so. In Brunei this means we have to come to terms with what happened forty five years ago, on a grim, dark Saturday morning, early on the 8th of December, 1962 ..."
This book is easily available at most bookshops in Brunei. 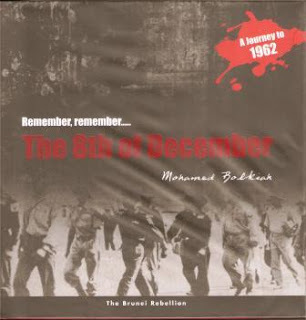 Title: "Remember, Remember, the 8th of December"
"Rebellion in Brunei: The 1962 Revolt, Imperialism, Confrontation and Oil" written by Harun Abdul Majid. I wrote an entry about this book a few months ago which you can link here. This book is written by Datuk Harun Abdul Majid, one of our local businessmen. This book arises out of his dissertation when he was doing his Masters at King's College in London and he carried out his research at the Department of War Studies there. What's different about Datuk Haruns's book is that his view is seen from the larger regional 1960s Malaysia-Indonesia conflicts. A number of British servicemen who served in the region noted the fighting in Malaya and Brunei was part of the Small Wars which the British soldiers, sailors, and airmen from Britain and the Commonwealth have been fighting to defend Britain's shrinking empire since the end of World War Two. I have not seen any bookshops in Brunei carry this book but the book can be bought online and cost a fair bit at around US$79. 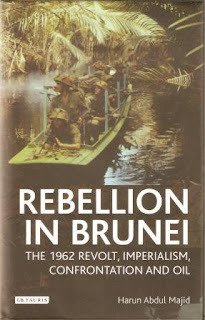 Title: "Rebellion in Brunei: the 1962 Revolt, Imperialism, Confrontation and Oil"
"Brunei 1839-1983: The Problems of Political Survival" written by D.S. Ranjit Singh. 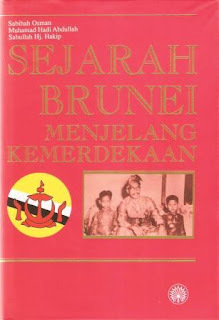 This was probably one of the oldest modern book about Brunei history. 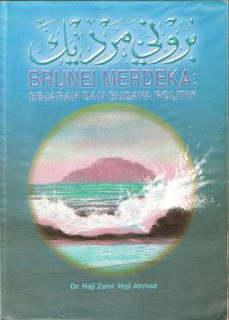 Published by Oxford University Press in 1984, the book remained for quite a while one of the most comprehensive written about Brunei's modern history. Ranjit Singh was a lecturer in University of Malaya when he wrote the book at the time when Brunei was taking her tentative steps towards full independence. It traced how Brunei's rulers struggling to maintain Brunei's autonomy and control Brunei's destinies despite the British and Western Imperialism in the 19th century. The success and the turbulent times of the 1950s and 1960s pave the way to Brunei's sovereignity and independence in 1984. This book is almost impossible to get hold of brand new now. I was lucky to have found a copy at the Select Books in Singapore many years ago and I doubt if you can find it today in any book shop. Most libraries will have this book though. 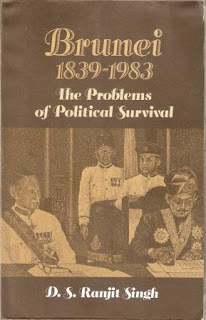 Title: "Brunei 1839-1983: The Problems of Political Survival"
"8 Disember: Dalangnya Siapa?" Written by our national historian and our Principal of Brunei's History Centre, Yang Berhormat Pehin Jamil and published by Brunei History Centre in 2003 is an official account of what happened on that fateful day in 1962. Surprisingly I was also informed recently by one of his officers that that fateful date is also Yang Berhormat Pehin's birthday. 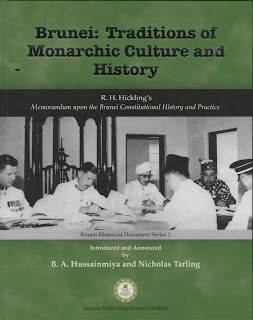 This book is available from Brunei History Centre and local bookshops in Brunei. 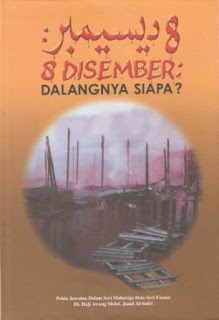 Title: "8 Disember: Dalangnya Siapa?" 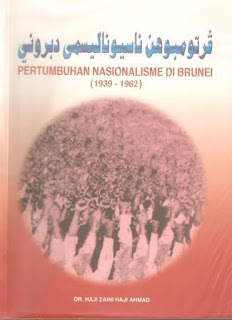 "Pertumbuhan Nasionalisme di Brunei (1939 - 1962)". This book written in Malay by Dr Haji Zaini Haji Ahmad was published in 2004 and contained the forewords of Pehin Jamil. Dr Haji Zaini (full name: Dr Haji Zaini bin Pehin Orang Kaya Shahbandar Dato Setia Awang Haji Ahmad) wrote it as an insider and was one of the main character of the 1962 event. This book is actually rewritten from an earlier book published by the writer below. Pehin Jamil described the book as interestingly written and recorded a part of Brunei's history which is still actively discussed. Even though the event remained a painful and bitter event for Brunei, we can only learn from it and pray that it will not be repeated in the future. This book is available at selected bookshops around the country for the price of $12. The last time I checked, only Kedai Buku Mega has it. Try also Book Lane at Delima, that shop tended to have unusual collection. Title: "Pertumbuhan Nasionalisme di Brunei (1939-1962)"
"Brunei Merdeka: Sejarah dan Budaya Politik". This book was published earlier by Dr Zaini in 2003. This is actually based on the manuscript that he wrote as his PhD thesis at Universiti Malaya in 1996. Its contents is almost similar to the latter book above. It also contained the forewords of Pehin Jamil. The book is divided into 10 chapters. It started with the old histroy of Brunei and end with the Brunei scenario of 1962 and the events and questions surrounding it. I will not try to summarise the book but hoped that you are able to read it for yourself and find out what the end is. The book is also available at selected bookshops throughout the country. The copy that I have, I bought it from Bismi for a rather expensive $23. Despite the price, the book is invaluable in the amount of knowledge it gave me. So I do hope you too will try to read the book. Title: "Brunei Merdeka: Sejarah dan Budaya Politik"
"Sejarah Brunei: Menjelang Kemerdekaan". This book published by Dewan Bahasa dan Pustaka Malaysia is written by a Malaysian and two Bruneian. The Malaysian was Professor Sabihah Osman from UKM and the Bruneians were Dr Muhamamad Hadi, who was the Deputy Principal at Brunei History Center before becoming the Director of Information and has since retired, and Sabullah Haji Hakip, an Education Officer at MOE. 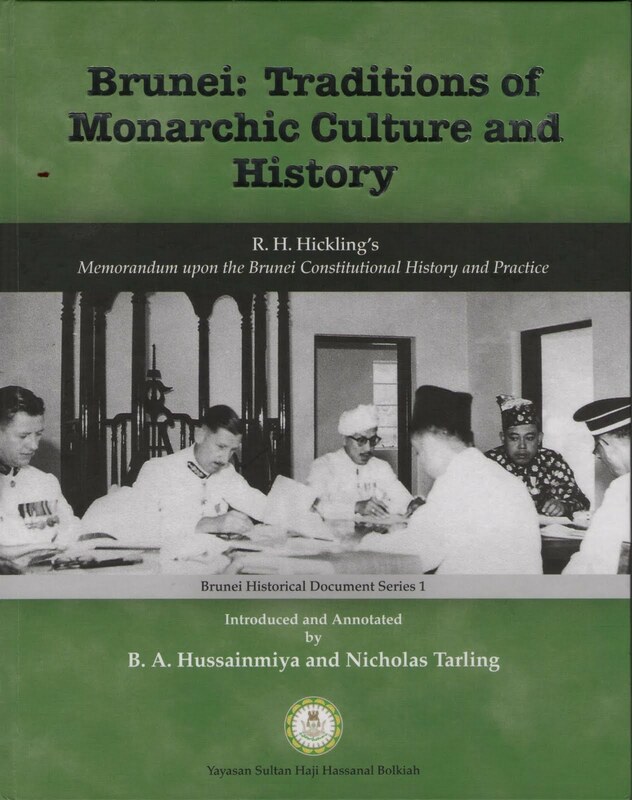 This book tried to avoid the usual historic theme of glory and fall but focused on several themes which are important to the Brunei's history. The book read more like a collection of essays written by the three historians but at the end does try to be more like a book. It has interesting photographs of Brunei's fishing industries and equipment as well as other photographs. The copy that I have I bought from Kedai Buku Mega in Kiulap for $22. I have not seen any other book shop carry this book. Title: "Sejarah Brunei: Menjelang Kemerdekaan"
"Brunei: Traditions of Monarchic Culture and History." One very recent book published by Yayasan Sultan Haji Hassanal Bolkiah also contained interesting background materials to the events of 1962. It was a memorandum written by R.H. Hickling. In terms of importance, it was as important as MSH MacArthur's 1906 Report of Brunei, however it has not been given as prominent as it should have been. Title: "R.H. Hickling's Memorandum Upon the Brunei Constitutional History and Practice"
You can link here to read more about the book including the book review (in Malay) which I did during the launching of the book at the Yayasan Sultan Haji Hassanal Bolkiah on 19 May 2011.
mr BR, you might be interested to know that there's a brand new book by a British author in regards to this subject matter as well.